Back-of-Bus panels (Seventies) measure 70” wide by 21” high (there are a few exceptions). Some transit companies use aluminum frames to mount the panels, others use vinyl 'cling' material. 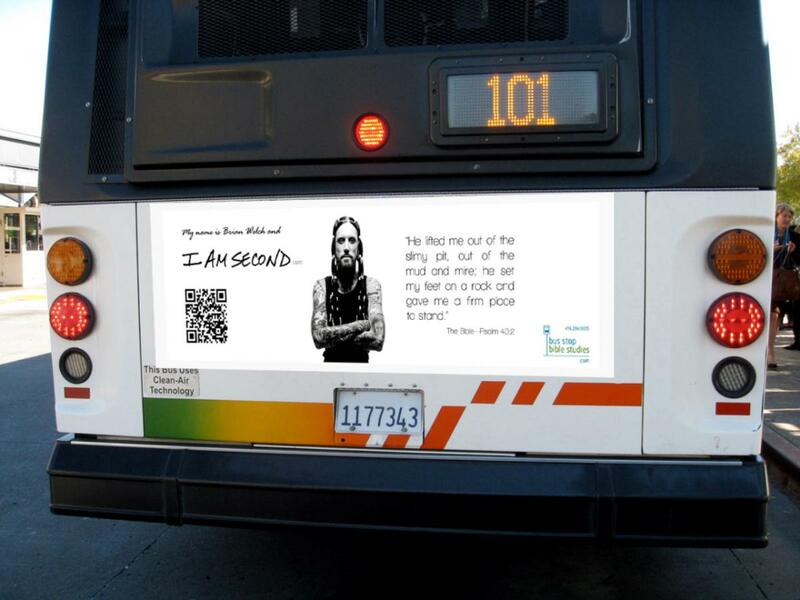 Back-of-Bus panels have the second highest viewership of all transit advertising mediums and are extremely effective for reaching the driving public. Short, high-impact messages can be easily read at stop signs and traffic lights. Seventies also provide very high exposure to pedestrian traffic. A back-of-bus Bible study panel comprises an eye-catching graphic, Scripture verse(s), a thought-provoking statement or question relating to the Scripture, space to identify the sponsoring individual or organization and contact information for Bus Stop Bible Studies. Not all study designs are suitable for back-of-bus panels. On the Sponsor page you can use the Select Style menu to view the Seventies (back-of-bus) studies. Posting durations are 16-weeks paid (plus 8-weeks bonus time subject to space availability for a total of 24-weeks) and 52-weeks (plus 12-weeks bonus time subject to space availability for a total of 64-weeks). During a 24-week campaign each ‘study’ will be seen* between 900,000 and 1-million times depending on Transit Company. During a 64-week campaign each ‘study’ will be seen approximately 2.5-million times. The cost can be as low as $1 per 1,400 impressions. * Source: BBM RTS Spring 2012 SM Research.